Nora Kramer Photography: Delicious Cheese Grits...4 Rivers Style! 1.) Preheat oven to 325° F. 2.) Bring chicken broth, salt and pepper to boil in medium saucepan over medium-high heat. Add the salt and pepper before boiling to allow the grits to absorb the flavor. For extra creamy grits you could also substitute 1/4 of the boiling liquid with cream or half and half. 3.) Stir in grits, reduce heat to simmer, cover pan and cook 15 minutes, or until broth is absorbed, whisking occasionally. Remove from heat. 4.) Add Cheddar, Velveeta®, butter, and garlic powder, stirring until cheeses are melted. Set aside. 5.) Beat eggs lightly in a small bowl. Whisk a small amount of eggs into hot grits, mixing well. Gradually whisk remaining eggs into grits whisking continuously. Whisk in milk. 6.) 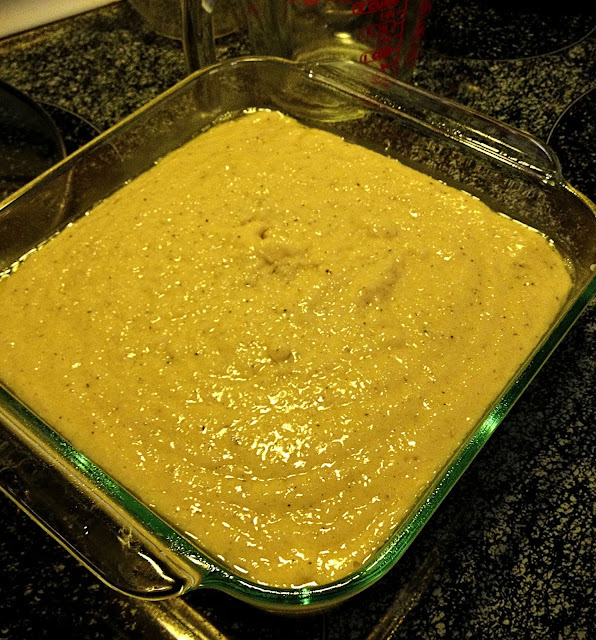 Pour into greased 8-inch-square baking dish. Bake 30 minutes. Let stand at least 20 minutes before serving. To serve in a specific shape, cover and refrigerate until cooled. Cut in desired shape in pan and warm in oven on low heat before serving. Instead of 4 cups of chicken broth, I used two of chicken and two of vegetable. I didn't have enough cans of chicken broth on hand. I don't think that made a huge difference. I also only had regular grits on hand (not instant) in the white variety. They were still very good, but I am betting the yellow is better! No cheddar or Velveeta® on hand so substituted a shredded monterey and cheddar blend I had and 6 American cheese slices. I am sure Velveeta® would have been creamier, but I doubt the taste was affected much. I put in more butter than it called for (by about double), because, well...it's butter! Probably won't do that next time around. Came very close to being almost too buttery. Stick with the recipe's suggestion of 2 tablespoons. I put in exactly the amount of garlic required, and I like garlic, but I think next time I may cut that back a tad. Just personal preference. The key to really having these turn out is the extra step at the end of letting them stand at least 20 minutes before serving. I would probably even go 30 minutes. The consistency hardens up a bit, making them easier to cut.